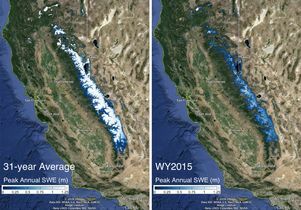 The image on the left shows the 31-year average snow water equivalent in the Sierra Nevada mountains compared with the snow water equivalent in 2015. Even with this winter’s strong El Niño, it will likely take until 2019 for the Sierra Nevada snowpack deficit to return to pre-drought levels, according to a new analysis led by UCLA hydrology researchers. Additionally, they suggest their new method, which provided unprecedented detail and precision, could be useful in characterizing water in the snowpack in other mountains, including ranges in western North America, the Andes or the Himalayas. These areas currently have much less on-site monitoring than in the Sierra Nevada. 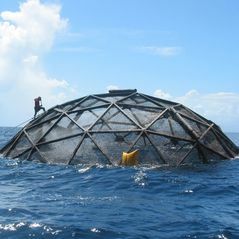 The study was published online today in The American Geophysical Union journal Geophysical Research Letters. “With the consecutive years of ongoing drought, the Sierra Nevada snowpack’s total water volume is in deficit and our analysis shows it will to take a few years for a complete recovery, even if there are above-average precipitation years,” said the study’s principal investigator, Steve Margulis, professor of civil and environmental engineering at the UCLA Henry Samueli School of Engineering and Applied Science. Much of California’s water comes from the when the Sierra Nevada snowpack melts. The winter of 2015 capped four consecutive years of drought that resulted in the largest cumulative drought deficit spanning the 65 years that have been examined. The water volume of the snowpack in 2015 was just 2.9 cubic kilometers, when a typical year is about 18.6 cubic kilometers. 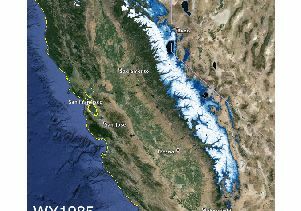 The researchers created a dataset covering 31 years (from 1985 to 2015), using measurements from NASA Landsat satellites, which provide daily maps of the full Sierra Nevada snowpack that have about 10 times sharper resolution that previously available. While there are on-site sensors throughout the mountain range, they are typically in the middle elevations and do not provide a full, high-resolution picture of the entire range, particularly at higher elevations, Margulis said. The researchers combined their new dataset with other snow survey data, collected by the state’s Department of Water Resources, to extend the time series of range-wide snowpack volumes back 65 years to 1951. Using the data, the researchers applied probabilistic modeling methods to make predictions of snowpack water availability. Accounting for the four-year snowpack deficit from the 2012-2015 drought, the researchers say it will likely take until 2019 to get back to pre-drought conditions. Other authors include graduate students Gonzalo Cortés and Laurie Huning, both members of Margulis’ research group at UCLA; Manuela Girotto, a research scientist with NASA’s Goddard Space Flight Center and with the Universities Space Research Association in Columbia, Maryland; and Dongyue Li, graduate student, and Michael Durand, associate professor of earth sciences, both of The Ohio State University. 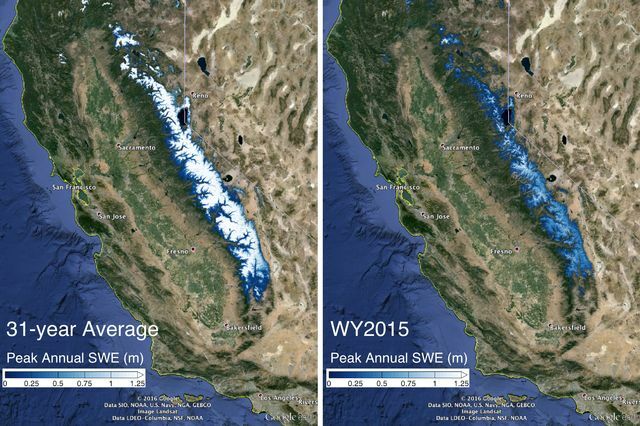 Winter 2015 Sierra Nevada snowpack compared with 31-year average (left). Animation of the snowpack over 31 years.